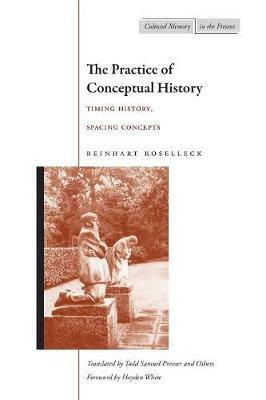 Reinhart Koselleck is one of the most important theorists of history and historiography of the last half century. His work has implications for contemporary cultural studies that extend far beyond discussions of the practical problems of historical method. He is the foremost exponent and practitioner of Begriffsgeschichte, a methodology of historical studies that focuses on the invention and development of the fundamental concepts underlying and informing a distinctively historical manner of being in the world. The eighteen essays in this volume illustrate the four theses of Koselleck's concept of history. First, historical process is marked by a distinctive kind of temporality different from that found in nature. This temporality is multileveled and subject to different rates of acceleration and deceleration, and functions not only as a matrix within which historical events happen but also as a causal force in the determination of social reality in its own right. Second, historical reality is social reality, an internally differentiated structure of functional relationships in which the rights and interests of one group collide with those of other groups, and lead to the kinds of conflict in which defeat is experienced as an ethical failure requiring reflection on "what went wrong" to determine the historical significance of the conflict itself. Third, the history of historiography is a history of the evolution of the language of historians. In this respect, Koselleck's work converges with that of Barthes, Foucault, and Derrida, all of whom stress the status of historiography as discourse rather than as discipline, and feature the constitutive nature of historical discourse as against its claim to literal truthfulness. Finally, the fourth aspect of Koselleck's notion of the concept of history is that a properly historicist concept of history is informed by the realization that what we call modernity is nothing more than an aspect of the discovery of history's concept in our age. The aporias of modernism-in arts and letters as well as in the human and natural sciences-are a function of the discovery of the historicity of both society and knowledge. Finally, the fourth aspect of Koselleck's notion of the concept of history is that a properly historicist concept of history is informed by the realization that what we call modernity is nothing more than an aspect of the discovery of history's concept in our age. The aporias of modernism--in arts and letters as well as in the human and natural sciences--are a function of the discovery of the historicity of both society and knowledge. Reinhart Koselleck is Professor of History at the University of Bielefeld.